Authorized by Instant Pot—the cookbook that makes using your Instant Pot easier than ever! The first cookbook to combine the hottest diet trend—the ketogenic diet—with the hottest kitchen appliance—the Instant Pot, featuring 175 low-carb, high-fat recipes for fast, delicious meals the whole family will love. The ketogenic diet is one of the most popular diets right now—and for good reason. It combines a customized carbohydrate restriction, moderation of protein intake, and real food-based fats. Followers of this lifestyle experience weight loss and improved energy, and never feel deprived thanks to its flavorful, natural whole foods! Emerging research is also showing this diet improves a wide range of diseases, from Type 2 diabetes, to Alzheimer’s, and more. Featuring photographs throughout, “I Love My Instant Pot” Keto Diet Recipe Book will show you how you can use the hottest kitchen appliance—the Instant Pot—to create keto meals that are quick, easy, and most importantly, delicious. 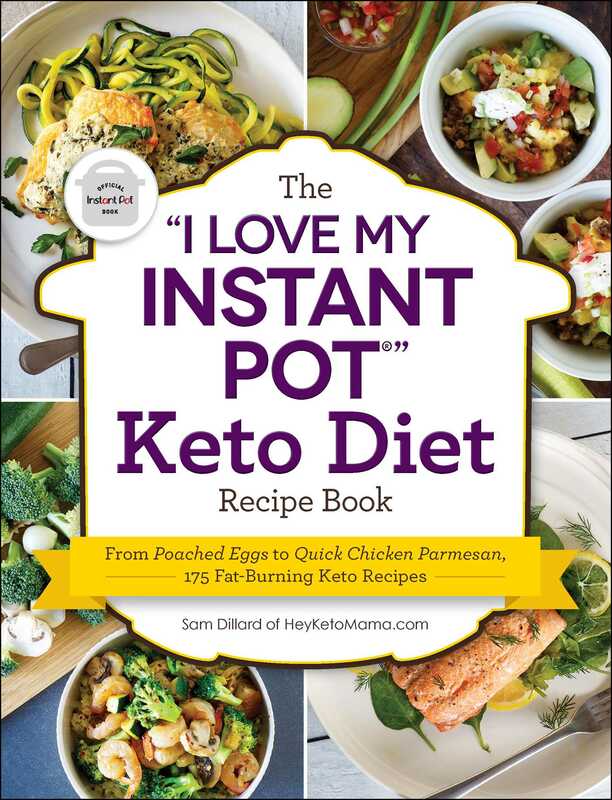 Sam Dillard is the author of The “I Love My Instant Pot” Keto Diet Recipe Book and the writer and photographer behind Hey Keto Mama, a food blog that cuts carbs and strikes out sugar without sacrificing yummy flavor. Her recipes have been featured in numerous publications including Women's Health and Brit + Co. She lives in Missouri with her husband and two young children. "I have been salivating over this cookbook the first minute I saw review copies floating around – so HURRAY when I found my very own copy in the mailbox today! Combining the hottest diet trend—the ketogenic diet—with the hottest kitchen appliance—the Instant Pot, this cookbook boasts 175 low-carb, high-fat recipes for super-speedy, delicious meals everyone will love." "Trying the keto diet? Your Instant Pot can help. It's not necessarily easy to adopt a ketogenic diet. But it is easy to use an Instant Pot to make everything from satisfying snacks and filling dinners to tasty desserts. So what could be smarter than combining the two? That's the plan behind The 'I Love My Instant Pot' Keto Diet Recipe Book by Sam Dillard of HeyKetoMama.com. From poached eggs to quick chicken parm, the book is packed with 175 keto-approved recipes you can make in a jiffy, with easy cleanup to boot. The ultra-low-carb diet the internet is obsessed with isn't for everyone–but if you're in the clear to give it a try, grab an Instant Pot, and get cooking!" "Keto-fy your Instant Pot with this cookbook, which promises 175 fast and tasty recipes you can whip up in your multicooker. Authorized by Instant Pot itself, the cookbook brings you legit techniques for poaching eggs and making Parmesan-crusted chicken." "If you’ve used an Instant Pot, you already know how this amazing gadget can revolutionize your cooking. That includes the super-trendy high-fat, low-carb keto diet. Grab your Instant Pot and get ready to enjoy some of Dillard’s simple, tasty keto recipes."